When you work in a business, it is common to use a server (under Windows Server or Linux) as a router, including to perform filtering or for another reason. Then, when you create a gateway, you also install a DHCP server to automatically distribute IP addresses to client PCs. This can be done with a physical device or a program installed on a server. In our case, our Linux server will act as a gateway (router) and a DHCP server. - a server on Linux (Debian 7.7.0 x64) with 2 network cards. The 1st connected on the WAN (external) and the 2nd on the LAN (internal). - a client on Windows, Linux or other. In our case, we used a PC under Windows 7. To begin, you must configure the 2 network interfaces (network adapter) of your Linux server. - On the WAN side (eth0 in our case), the Linux server will have a static IP address (depending on the IP class of the WAN). - On the LAN side (eth1 in our case), the Linux server will have a static IP address that will match the IP class of the DHCP server existing on the LAN or of the DHCP server that we will install under Linux. Here is our network configuration for the WAN static IP (/etc/network/interfaces). Note : don't delete the lo interface (loopback). And our DNS configuration (/etc/resolv.conf). Note : these are public DNS servers of Google. Then, for the LAN interface, you will need to use a network ID. - a "10.0.0.254" IP address on the LAN side. This is the address that clients should specify as the default gateway. Finally, reboot the machine to save changes. When you configure a server to act as a gateway, you usually install a DHCP server on that same server. Indeed, machines on the LAN must have an IP address to communicate with your gateway and therefore have access to the Internet. If your Linux server and clients are plugged into a switch, you will also need to install the DHCP server on your Linux server or on a server on the LAN. In our case, we will install a DHCP server under Linux. To do this, install the "isc-dhcp-server" package. Note : isc-dhcp-server is the replacement for dhcp3-server. In addition, if you attempt to install the "dhcp3-server" package, you will see that Linux will automatically choose to install the "isc-dhcp-server" package. At the end of the installation, you will see that the attempt to start the DHCP server will cause an error. If you look in the file "/var/log/syslog", you will see that this error is due to the non-configuration of the "dhcpd.conf" file. Oct  7 13:20:19 debian dhcpd: No subnet declaration for eth1 (10.0.0.254). Oct  7 13:20:19 debian dhcpd: Not configured to listen on any interfaces! To resolve this issue and configure your DHCP server, you will need to modify the file "/etc/dhcp3/dhcpd.conf" or "/etc/dhcp/dhcpd.conf" (depending on your Linux distribution and version). In this file, you will find several important information. The domain (or "Connection-specific DNS Suffix" under Windows). This is the local domain name on your network. Setting this value is useful if you have an Active Directory server on your local network, for example. Then, you can specify which DNS servers your clients will use. Either, you specify Google's public DNS servers, either your Internet Service Provider (ISP) DNS servers or your gateway's IP address if you intend to install a DNS server on it (for example, BIND). In our case, our customers will use Google's public DNS servers. Note that by default, the lease (validity period of IP addresses will be 7200 seconds, so 2 hours.). With the DHCP server, you can automatically assign IP addresses to computers on your network. However, a DHCP server can also assign the same IP address to a specific machine (for example : another server on the same network). To do this, just add this for each static IP. Note : to find the MAC address of a machine, use the command "ipconfig / all" on Windows or "ifconfig" on Linux. Finally, we will enabling the packet routing on our Linux server so that it behaves like a router (a gateway). To do this, edit the "/etc/sysctl.conf" file. And uncomment the "net.ipv4.ip_forward=1" line. Then, edit the "/etc/rc.local" file. And add this before the "exit" line. Now, at each boot, these 2 lines will be executed and the Linux firewall will therefore accept to forward packets between your 2 network interfaces (network cards). Restart your server to apply the changes. Or type the two commands "/sbin/iptables ..." to avoid having to restart now. To forward ports under Linux and thus be able to access a local server from the outside (for example : from Internet), you need to add this in the "rc.local" file. - eth0 : corresponds to the WAN interface (external / Internet) of your Linux server. - informatiweb.no-ip.org : the external domain name, or the external IP address of your Linux server. 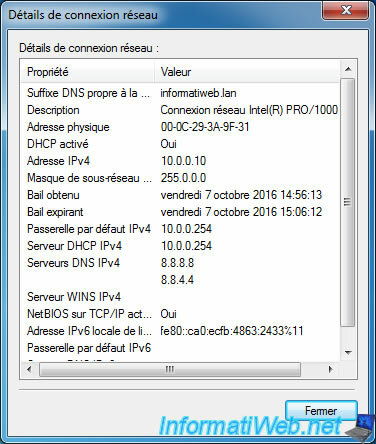 - to 10.0.0.2:80 : the IP address of the server on your internal network (LAN) and the port on which your server is listening. Here a webserver (Apache or IIS) which listens by default on the port 80 (HTTP). To test our configuration, we used a Windows client. But it will work with any machine and any operating system (Windows, Mac, Linux, ...).